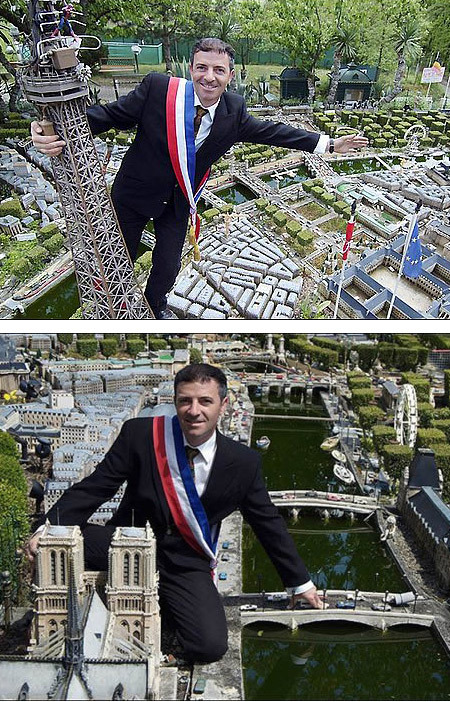 Gerard Brion took up the challenge of building a miniature model of Paris 15 years ago. With 18,000 hours of painstaking work logged, he has crafted a miniature city, known as Le Petit Paris, in his garden in Vaissaic in the South of France out of salvaged items like old concrete blocks, baby food jars and soup tins. 150,000 visitors a year experience over 40 Paris monuments, such as the Champs Elysées, Montmartre, the Seine River, and the Eiffel Tower on a 1:130 scale set in a French-style garden planted with 400 bonzais. Madurodam produces it's models, railways and decoration. Before we place a model in the miniature city, our employees have to do a lot of work. For example, it took two years and four months to build the model of Amsterdam Airport Schiphol. Madurodam has a database of the models in the miniature city. Use the map of Madurodam. You can make a selection on district in Madurodam or the city where the original building is located. Everything in Madurodam is made on a 1:25 scale. The models are accurate and built at Madurodam. Once the model is built, the decorators apply the priming coat before the actual decoration. Tiles, canopies, decorations, etc. must look real. Take a trip back in time with this 400 square feet model. Created in 1977 by 300 workers for the 60th anniversary of the Bolshevik Revolution, is a very detailed depiction of the USSR’s capital. 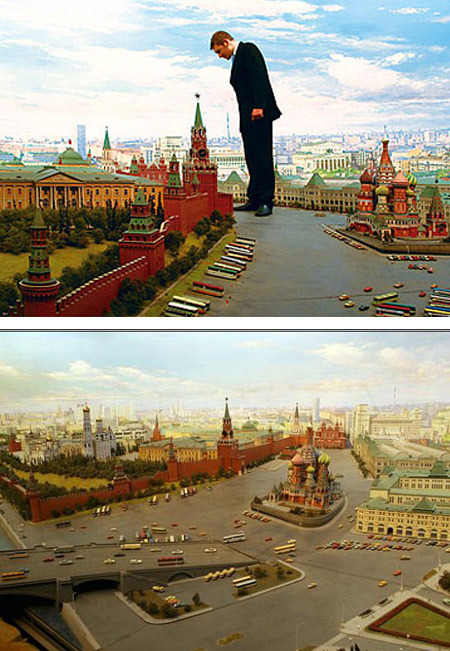 This scaled piece of propaganda by Russian artist Efim Deshalyt was designed to be visited and admired and ultimately to show that the Soviet Union’s capital was more magnificent than any Western capital. While the model is no longer visited by loyal party members, it is visited by curious tourists who want a peek of the Soviet Moscow of yesteryear. It is currently for sale with an asking price of $3 million dollars. 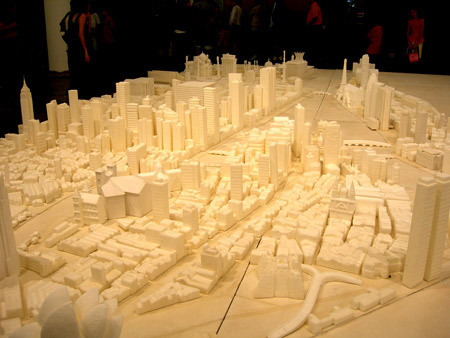 Another fantastic cityscape made from a range of unusual objects, this time out of loads and loads of white sugar. Artwork by Meschac Gaba. He filled it with instantly recognizable landmarks from around the world, such as the Taj Mahal, the Eiffel Tower, the Sydney Opera House, the London Eye, Petronas Towers, the Reichstag, the Empire State Building, and more. There are 600 buildings in the fantasy city, which measures 30 feet by 20 feet and took two years to build. Chinese artist Song Dong used thousands of biscuits and sweets to create a replica of an Asian city complete with a stadium and a church. The cityscape, installed in London department store Selfridges, was comprised of over 72,000 edible treats including caramels and fruit shortcake. Once it was completed, customers were invited to dig in. 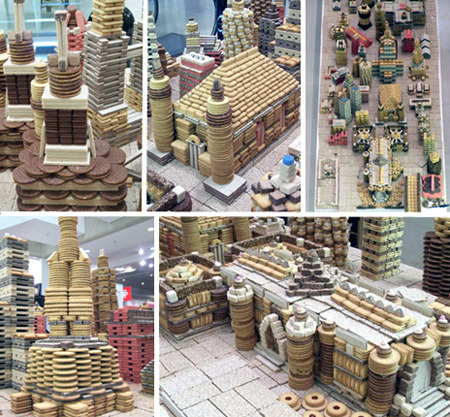 A team of artists have been working on the biscuit city at a London department store for six days. How can one not be amazed by the intricate workmanship and incredible patience one would need to accomplish this miniature masterpiece? An origami artist from Japan, Wataru Ito, has spent four years crafting an incredible model city from paper - but now plans to burn it down. The entire piece - which measures 2.4m by 1.8m and is 1m high - has been crafted using only paper, which Wataru stuck together using craft glue, an art knife and holepuncher. After failing a university entrance exam three times he focused on this project, which became so large he had to sleep under a table in his tiny flat. 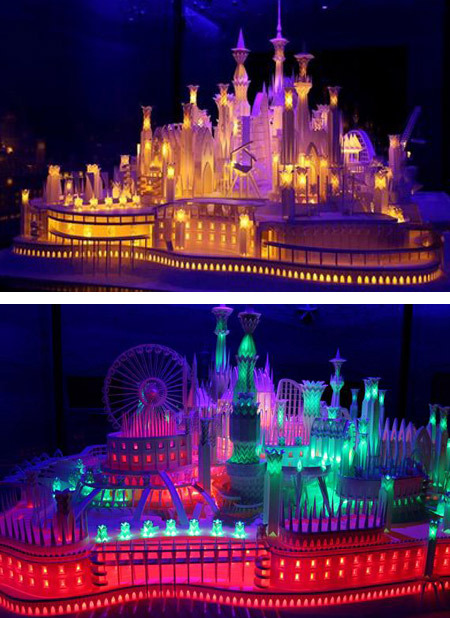 Stan Munro builds famous landmarks out of millions of toothpicks. This Toothpick City took him six years. It is build with six million toothpicks and 170 liters of glue. Stan Munro works for the Museum of Science and Technology in Syracuse, New York, USA. 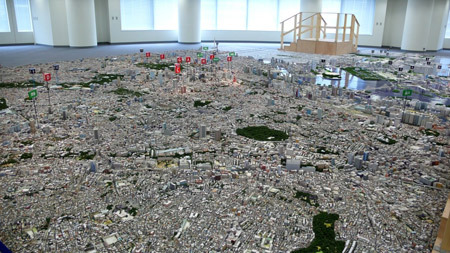 Located in the Roppongi Hills Mori Tower, a 1:1000 scale model of Minato-ku in exquisite detail is on display.The scale model was recently used to show potential sites for Tokyo's bid for the 2012 Olympics. Each building was photographed by helicopter and by car with the composite image used for the model. The entire process took over 14 months. The model covers the area from Yoyogi Park, Shibuya, Azabu, Roppongi, Shinagawa and the man-made islands of Tsukishima and Kachidoki. 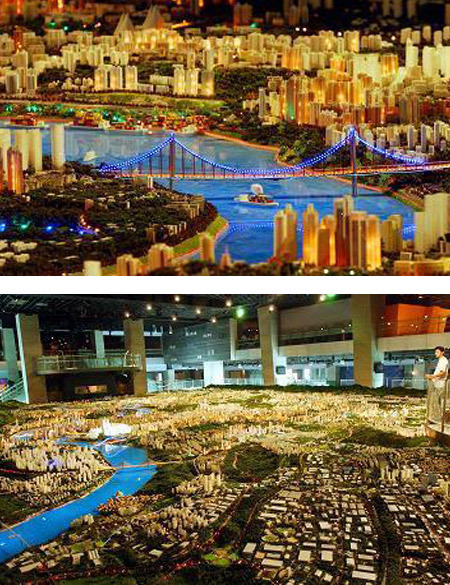 A view taken on Sept. 14, 2005 shows the model of southwest China's Chongqing Municipality at the city planning exhibition hall in Chongqing. The 892-square meters-wide model, representing the overall view of this mountainous city with a scale of 1:750, boasts to be the largest of its kind in China. 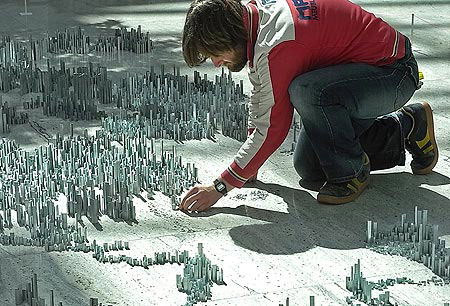 Careful now... artist Peter Root fixes the final staples to his New York-style miniature city. Peter, from Guernsey, spent 40 hours standing 100,000 staples on end to build his latest work of art. And he'll take just seconds to destroy it - by knocking it over with marbles.